Get the most efficient land-surveying tool. Share your data with your team directly from your CAD platform. Verify your results and add precision to your proofs. Create a faster and more precise drawing from field data. Geomatics has always been a science of “truth and accuracy”. But it has mainly evolved technically and strategically. Looking for a land surveying software? Integrates into BricsCAD®, AutoCAD®, Microstation®, PowerDraft®, and helps to automatically draw all the information from plots, segments, annotation distances, directions, as well as areas representing sinuous rivers. Allows to automatically create parcels from survey points or from existing drafts. Place, move, and rotate building footprints inside a parcel with ease while respecting the chosen constraints. Helps creating, editing, and triangulating surfaces by allowing to select points and breaklines. Offers four methods for calculating volumes: by comparing surfaces, comparing planes, cross-sections and solids. Control and manage data collectors from importing and exporting to managing the linework using desired standards. Brings linework from the field to the drawing using its powerful chain manager. This land surveying software integrates the CAD platform you are actually using. Processing Point Clouds? 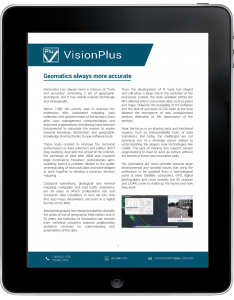 Discover our LiDAR software.